In an after-school enrichment class, children aged 6-11 were making projects inspired by the work of great artists. Through these projects, students learned about the artist and their style/s, art movements, how to work with various materials, and hopefully, how to use the work of a known artist as a jump-off point for their own. In a Spanish language immersion school, we learned about Spanish-speaking artists, including Pablo Picasso who was influenced by African art, and helped to create and launch the experimental movement of Cubism. Students were taught to “pound out” or flatten their clay “chunks” into slabs, after forming them into loose balls. They then developed their slabs into faces by shaping and texturing them, cutting pieces out, and adding to them using a “scoring” technique, so that the pieces added wouldn’t fall off when the clay began to dry. Well, a modified scoring technique, which included adding texture to the two pieces that were to be attached, and pressing them together to increase their bond. This proved challenging for the children, as it was hard for them to understand why this was necessary. Another challenge was how thin many of the pieces turned out to be. They are drying now, and I am extremely careful in moving them around, and turning them over, so all surfaces can dry. The students produced highly fanciful, expressive and emotive works, qualities only intensified by the delicacy of some of them. This young artist made the little figure on the face as a separate piece at first, but it was so thin and fragile I knew it would not survive. Luckily, she was happy to add it to her piece and play with surrealism and scale! Día de Muertos, the Mexican holiday of “Day of the Dead” influenced the students’ work, as in this 6 year old’s tiny skeleton gracing the back of her mask. Again, this tiny figure was to fragile to stand on its own, so now it has become a part of Mia’s signature! Skeletons, whether smoking a cigar or not, inspired the students, as did…. pumpkins! This is one ferocious pumpkin face, and at least twice the size of most of the other pieces. The young artist got caught up in his work towards the end of the hour, and insisted on finishing all of the teeth, and details of they eyes. Now…what will he add to this piece this week, to finish it off? What will each of the students do with paint, to complete their works? Let’s hope all of the pieces dry, so we can find out! Maria Montoya Martinez and Julian Martinez were two of the most highly acclaimed potters in the Southwest. 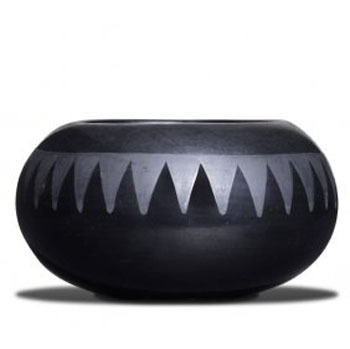 They became known throughout the world for their highly polished, black on black and multicolored functional ceramics, also called pottery: works made of clay. 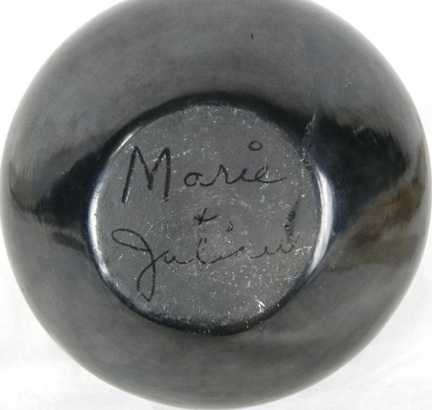 Of all their achievements together, Maria and Julian are best known for their invention of “black-on-black” pottery. At one time, Maria signed her work as “Marie”. 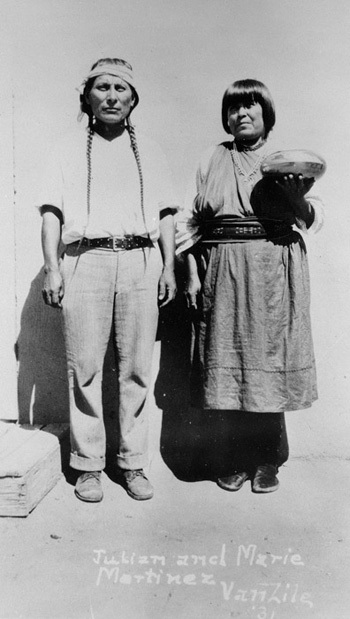 Maria and Julian were from a community called the San Ildefonso Pueblo, 20 miles away from Santa Fe, in the valley of the Rio Grande, in the Black Mesa country of New Mexico. They married in 1904, when Maria was age 17 and Julian age 25. New Mexico is also where the Artist Georgia O’Keeffe worked during the second half of her life. O’Keeffe was inspired by the landscape and nature of New Mexico. 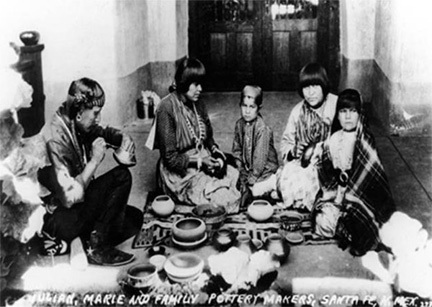 Maria learned how to make pottery at an early age from her aunt. She only went as far as the third grade in school, and did not speak much English. 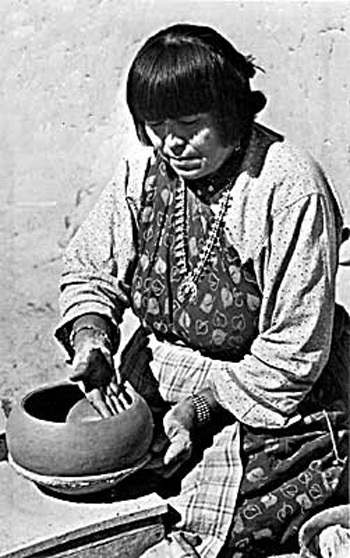 Traditional pottery making techniques were being lost, but Martinez and her family experimented with different techniques and helped preserve it. 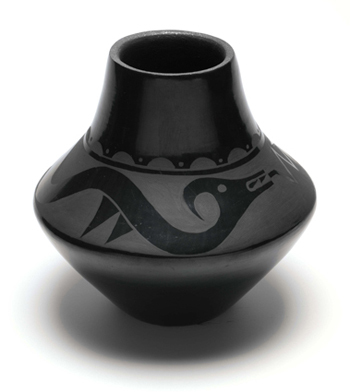 In 1908 black-on-black pottery that had been crafted by the Pueblo people from the 1600s was found. 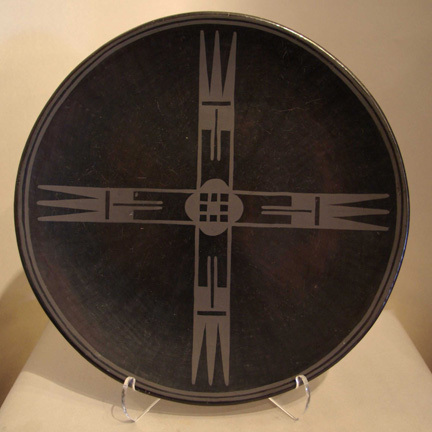 Maria Martinez, known as a skilled pueblo potter, was asked to re-create this ancient pottery style. 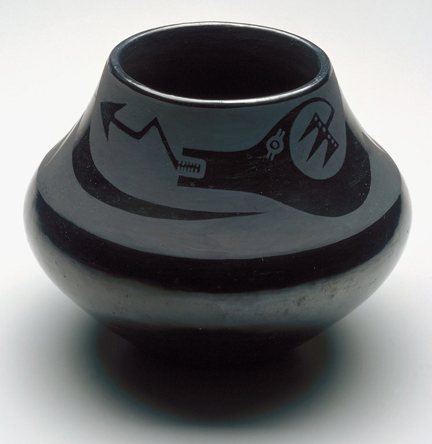 She experimented, finding that she could create pieces with a deep glossy black background and dull black decoration: black-on-black pottery, or “Blackware”. 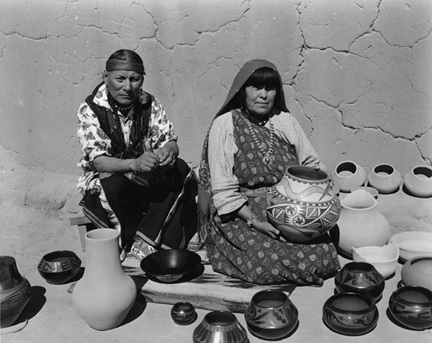 Embarrassed that she could not create high quality black pots in the style of the ancient Pueblo Peoples, Maria hid her pots away from the world. She worked tirelessly to perfect the art of Blackware pottery. 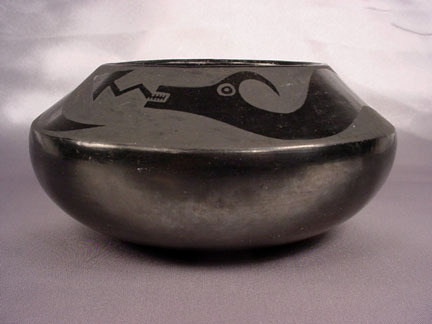 Her skill grew with each pot, and her art began to be recognized by collectors and developed into a business, focused on the then-unique Blackware style. Maria made her own clay. She gathered and combined red clay, and blue sand, and mixed it by hand. She only gathered what she needed. She built her pottery completely by hand, forming the base of the vessel and building up the size with “rope” coils. 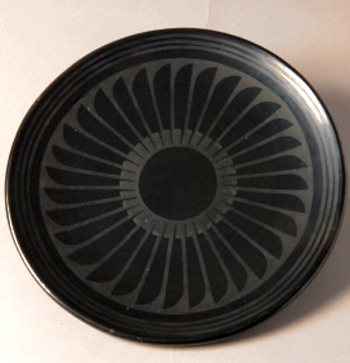 In 1918, Julian finished the first decorated Blackware (sometimes described as “black on black”). 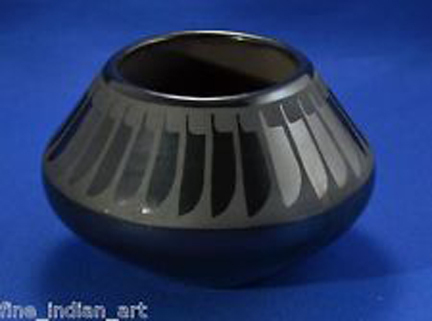 pot with a dull background and a polished, shinier Avanyu design. Avanyu, a horned or plumed water serpent is the “guardian of water”. Its curves suggest flowing water or the zig-zag of lightning. The snake’s body movements seem alive, showing the appreciation the Pueblo peoples have for nature and life. “The first rush of water coming down an arroyo after a thunderstorm, a symbol of thanksgiving and for water and rain” was the interpretation by Julian of an Avanyu. 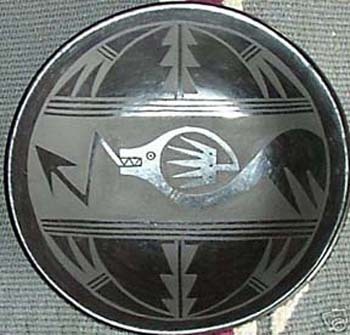 Avanyu may be related to the feathered serpent Quetzalcoatl and is used as a decoration on Native American pottery of the Southwestern United States. The designs on each pot give the pot a personality and unique individualized look. Many of Julian’s decorations were patterns adopted from old, old pottery of the Pueblos. Some of the stylized designs showed birds, road runner tracks, rain, feathers, clouds, mountains, and zigzags. Julian had the skill to execute his vision with a precise, even hand that set a new standard for his generation of Pueblo painters.